Choral music in Northern Michigan that moves our souls. 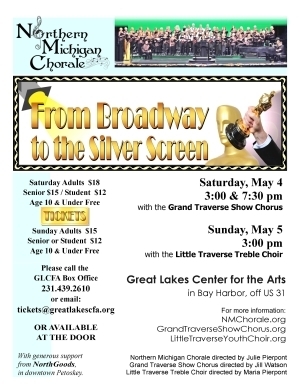 The Northern Michigan Chorale is celebrating their thirty-sixth season of performances, both spring and fall. We began as sixty voices at the first rehearsal and have now grown to a group of one hundred-plus persons. Our members range in age from teens to senior citizens. Continuing, as in the beginning, with a no audition base of volunteers, our members represent Petoskey and many of the surrounding towns of northern Michigan. The Chorale awards Vocal Music Scholarships to area residents who want to improve their singing. Music enjoyed by the Chorale and their audiences is comprised of songs from Broadway musicals and from arrangements of composers; Gershwin, Rodgers and Hammerstein, Irving Berlin, Cole Porter, John Lennon and Paul McCartney to name a few. Crooked Tree Arts Center presented the Northern Michigan Chorale the 2007 eddi Award for Arts and Cultural Organizations for the benefit of the citizens of Charlevoix and Emmet Counties. In looking back, we have a chance to look forward and in so doing, the Northern Michigan Chorale truly knows the meaning of the song … “We’ve Only Just Begun”. Copyright©2019 www.nmchorale.org - Produced by Gaslight Media, All Rights Reserved.